Just who is the Agent here? Annett…. by any other name…. One of the claims to fame that Kevin and Bill Annett frequently advertise is that they are related to Peter Annett who was an influential Deist and Freethinker of the 1800’s. Their focus, in their claims to his genealogy, is on Peter’s stint in the pillory and his year spent in jail for sedition and heresy. When researching this history, I found that Peter Annett’s name was actually spelled with one ‘t’ and not two… How did Kevin get this wrong? Were Kevin and Bill actually related to Peter at all? It seemed like a good subject to research. Here is a synopsis of what I found… The question of the spelling’s led me to discover that many spellings of the name existed in various parts of Europe including Spain, France and England. The specific origin may be related to Annot (France), or Annetti (Italy), although this is contested amongst various members of the Annett clan. The best source I discovered so far was at annett.ca which not only describes the origins and exploits of some of the members of various Annett branches, but also permits a glimpse into the mind and character of Peter through some correspondences left by him. I have been unable to establish whether Peter was married or if he had any children for that matter. It is possible but not guaranteed. In addition, it is important to note that another ancestor, named Philip is given similar mythical status with regards to the Upper Canada Rebellion. Philip was indeed a farmer and in the military, but beyond that, nothing I found confirms his participation in the Upper Canada Rebellion. That information remains anecdotal and originates only from hiddenfromhistory.com and other Annett authored sites. I can attest to the fact that when we are particularly fond of our ancestors and our heritage, history is often far less glamorous than the stories we’ve heard ’round the campfire. Embellishment of the tales we tell is part of what makes good storytelling, If we committed ourselves to simply stating the facts we wouldn’t hold the ear of an audience, much less have an urge to recite them over and over again. I expect that a little of this is true when it comes to Kevin’s description of his ancestor’s Peter and Philip (although I have yet to prove the genealogy). You may find the bit’s I’ve extracted from the annet.ca site to be tedious and boring to get through, but even with light skimming, you will get a sense that Annett’s flourished through many parts of Europe and had an entrenchment in religious society that was both for and against Christianity. In fact, two separate Peters had very different experiences; the earlier Peter was prosecuted for having an unsanctioned translation of the Testaments in his possession and was burned at the stake for it. Quite the opposite from the later Peter that Kevin uses in much of his dissertations on his family heritage. Kevin could have chosen Peter the former as an example of religious devotion had he chosen to fulfill his ministerial oaths and done the job he supposedly was called to do. Instead, Kevin chooses Peter the latter, who is conveniently a victim of the church in a similar way that parallels Kevin’s own claims of persecution. It is through him that Peter lives again; seeking justice and free thought where it could not be found in the 18th century. I now leave you with a little Annett history…. The year 1555 saw the arrival at Druridge Bay, Northumberland, of Rolphe Annot, one of three brothers, the others being Rowland and Peter. Rolphe became the progenitor of a family that has come through to modern times with representatives in many parts of the world. Rowland was recorded as being domiciled in Ratcliffe in the, London parish of Stepney on 14th May 1559. This part of the city was then a teeming and congested area without the walls where many foreign nationals lived. Rowland was named as a ‘Subject of the King of Spain’, an allegiance owed through birth in a Spanish dominion or conquered country: this he changed when on 4th March 1562 and on payment of a fine of 16s -to the Keeper of the Great Seal, he became naturalised. This in itself proves residence in the country since 1555 for in order to obtain papers of naturalisation proof had to be given of seven years continuous stay in this country. One last mention in the records of the day sheds a tiny ray of light upon this Rowland; on June 22nd 1563, he was recorded as being a regular member of the German church in London, a weaver by trade and having no children. Thus he was a Lutheran, probably one of those refugees from the Low Countries who were to make such a great contribution to the prosperity of the English cloth industry throughout the reign of Elizabeth. The third brother, Peter, was not so fortunate. His flight to England was ended at Dunkirk where he was arrested in possession of proscribed printed material; “many books concerning the new reformed religion (of Calvin,”heretic”), like bibles and forbidden catechisms”. In April 1561 he was put in the jailhouse, judged, held up to public indignation in front of the Town Hall, burnt alive then hanged to a post as a warning to others. It is interesting that the Annett coat of arms (described in Burke but for which there is no specific grant in this country) has three hearts emblazoned upon it. 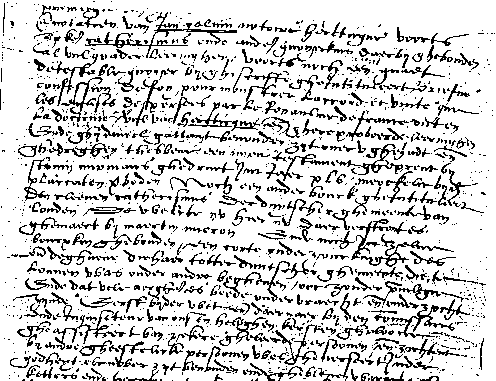 Examples of the French form of the family name may be found in several of the registers of the London Huguenot churches: in the registers of Crispin Street, for example, are recorded the baptisms of the four children of M. Pierre and Marie Hannat, of Grey Eagles Street, Stepney, all between the years 1700 and 1709. The baptisms of the eight children of Paul Hanet, or Annet, and his wife, Marie Francoise, were recorded at the French Church, West Street. Pierre Hanet was a witness to the marriage of Paul Hanet of Paris and Francoise Hyard at the French Church of the Tabernacle in 1699. .In the years that followed their children were baptised at the French Church of the Savoy and the spelling of the surname varied each time between ‘Anet’, ‘Annet’, ‘Hanet”and ‘Hanette’. This Paul was almost certainly the son of Catherine Hanet a refugee widow from Paris who was accepted in to the Church of the Savoy in 1686; at that date she was 48 years of age and Paul, then aged nine, was the youngest of her three children. ˆAll kinds of records, public and private, chronicle the advent of the Huguenots and chart their path towards integration into English society; a society that at the time of their arrival was in many ways well behind that which they had renounced in France. It was .in the 18th. century that the famous deistical writer, Pieter Annet, lived; born, supposedly in Liverpool, in 1693, he was a challenging and provocative personality who was eventually to be imprisoned for his writings. Despite his fame, or notoriety, his origins are unknown and even his new system of shorthand rates only a note as a step on the way to the now almost universal ‘Pitman’s’. Throughout his lifetime the rate of intermarriage between the Huguenots and their English hosts and neighbours accelerated and absorption into English life completed. English names were adopted; Abraham de la Neuve Maison became Abraham Newhouse; Pellegrins became Pilgrims and Dubois became Wood; Hanet most probably became Annett. And thus this last wave of continentals provided a fresh source for the name in this country whilst their other versions remained in the civil and church records of their original homes. You, Pieter Annoot, born in Belle (1), and you, Daniel Gallant, born in Steenwerk (2), both subjects of the king, our formidable and sovereign lord (3), having in mind to sail to England from this town (4) last November, and having been stopped and spoken to by the king’s bailiff, were found to have. in your possession notorious forbidden reformed books and writings, which are prohibited by his Majesty’s placards (or proclamations) to be carried on you because of their heretic contents, namely you, Pieter Annoot, the new testament entitled ‘The new testament translated from Greek into French’ , without his Majesty’s permission, with letters and annotations by John Calvin, notorious heretic; furthermore a certain catechism and other documents were found with. it, all full of bad teachings; furthermore, an evil and detestable written document entitled ‘Brief Confession of Faith to demonstrate the accord and unity concerning the doctrine of the churches dispersed in the kingdom of France’, which is full of heretic and reformed teachings. And you, Daniel Gallant, were found to be carrying on you a new testament printed by Steven Mirmans printed in the year XIV (5), clearly forbidden by the placards, and another book entitled ‘The little catechism of the Dutch community in London’, written by Martin Micron (6), and which is now spread here and over there. And inside the little book was bound a short enquiry about, those who joined -or who have travelled to the Dutch community in London, also without permission. But what is much worse, both having been questioned and examined, first by the legal authorities and thereafter by the inquisitor of our holy christian faith, assisted by certain learned persons, and since then by other clerical persons very knowledgeable in theology, you both have been found and remained true heretics fallen from our old catholic faith and our mother the holy church; notwithstanding the feigned simulated and false external conversion by you, Pieter Annoot, showing penance for a long time, going to confession and receiving the dignified holy sacrament at the altar, thus deceiving the justices and His Majesty, as you both now well demonstrate by sustaining and pertinently persisting that there are only two sacraments, which for you both is a gross error, and furthermore, you are rejecting the goood institutions and traditions of our mother the holy: apostolic and Roman catholic church, by both parties conspiring to cut yourselves away (or to detach) from the church and also perturbing our holy religion and common welfare. The Trial and Sentencing of Pieter Annoot. As a Satirist, Annett is, to my thinking, far greater than Pope or even Byron. He was greater as a Man and his purpose, the greatest imaginable -to enlighten and free humanity from false faiths and fears. He did not waste his talents and energies in sneering and mud-slinging at insignificant individuals who annoyed him; he never indulged in spiteful petty animosities. He aimed his arrows with unerring accuracy of vision and aim at Superstition -the creeds of the Christian Churches -made up of myths, “magic and mysteries. He never missed his mark. Sometimes his attacks are scathingly vitriolic -so were Voltaire’s – and so, too, were the winged shafts of Lucian, the greatest satirist the world has ever known. Like Lucian, Annet devoted his genius to attacking the tyranny of superstition – the matured form of a parasitic growth that was in its infancy while Lucian was annihilating the old Greek gods. Like Lucian, Annet gave of his best to free humanity from fear and illusions and to promote human happiness. Two intimate personal letters written by Peter Annet to an unnamed friend in Wiltshire, were published fifteen years after his death, in the Gentleman’s Magazine. They were prefaced by a short letter, unfortunately- like the other contributions to that Journal – only initialled. I am indebted to Mr. H. Cutner, author of ‘Pagan Elements in Christianitv’ (Pioneer Press), a well-known contributor to the ‘Freethinker’, for having made complete copies of them for me in the British Museum. It is evident from these letters that Annet either had resided at Salisbury, held some position or stayed there for some considerable time at an earlier date; that he made a circle of good friends in that town, who remained loyal to him throughout his long life and who really helped to relieve his sufferings and want when in prison. With regard to the Poem on the “Fall of Man”, we have endeavoured in vain to trace it or to discover anything about it – whether it was ever published, or what became of the manuscript. Peter Annet’s earlier poem, “Necessarian” (I739), proved that he was a true poet, and doubtless he displayed a virile treatment of his theme and a magnificent mastery of logic as well as language in his blank verse. Two Original Letters from Peter Annet. In answer to the enquiries of our correspondent F.X. after Peter Annet (Of whom see Gent.Mag. Vol.32 p.560) I send you copies of two original letters to a gentleman of this city. At the time of his persecution he was thought to be so hardly dealt by, that a subscription and sent him in Newgate, from some liberal minds in this neighbourhood. Peter told the gentleman who delivered the benefaction, that Lord B-e had been applied to for a ‘noli proseqi’; but his answer was, that “the Bishop came foaming at the mouth against this man, and what could he do ?” -Archbishop Secker afterwards so far repented him of the evil, that he relieved Peter Annet of his distress, to the day of his death. If his head had not been bruised, he would not have wanted a plaister. You will I hope pardon the trouble I give you by this letter. I am much obliged to you for the favour of yours, and take the contents kindly, particularly that I have not outlived the remembrance of my friends. The pamphlet I ordered those at Salisbury I know to be not worthy of their acceptance, respecting the value or matter contained in it. It was intended as pap for babes, not meat for strong men I was willing to make the best I could of a bad cause, to induce men to embrace a good one. It is the most christian piece that ever I wrote, or shall write. That, and another like it, which lies by me in manuscript, have cost me the most study of any, and I like them the least. .I must own they are rather legal than legitimate offspring, the production of art than nature; and this last has told the least of any, so that I intend to print no more; but yet I have such affection to the children of my spirit, which are many, that I would fain bequeth them to some that will have mercy on them, and shew them such oompassion as that they may be known to the world, though I would not have their friend to be a sufferer. But I must leave all that to fate or chance. I care not which it is or what it is called. I am now writing on the fall of man, in blank verse. But it is far different from Milton in sense. I wish it was equal to his poetic genius; but of that you must expect it to fall abundantly short. Besides, it is much a question of whether truth can shine away the lustre of falsehood; for this is all glorious within, and that without. As it wants no scenes or gaudy embellishments to the lovers of it, its intrinsic value and glory being sufficient to those that know it, so it never courts popular applause, the praise of fools and knaves, who make up the mob, the vulgar, the crowd of mankind. I believe it is the last work I shall attempt, and if my zeal and cogitation. can be conquered, as I would have them, it will be so. I was born with the seeds of strong passions, which growing up with me, could not prevent my displaying them in time. But these have been of the softer kind, and nothing yet abated by age; and, therefore, religion having been early implanted in my nature, which works up the passions, and love and resentment too, I have felt to make keen impressions in my disposition ; and, therefore, perhaps, I am more stung with jealousy when my friends seem to desert me, than men in common are. I unbosom to you my breast; I impart to you the weakness of my soul; I melt while I express it. I cannot read any love affairs, where that passion is strongly expressed, but I am as strongly affected, so as it gives tears to my eyes, and pain in my heart, even to the taking away my stomach for food, and for some time giving me the headache, and this weakness is insurmountable; and it may be too, that I prefer the friendship of friends, and an honest reputation, beyond wealth. The love of money is nothing to me, but the love of friends is much; yet the hatred of enemies I despise. I will therefore put you and my friends in the way, since you desire it, of returning what you are pleased to call my civilities; that is, that some or other of them would let me hear from them now and then. Let me not be dead to them before I die. And if I could serve you or them, in anything here in town, I should be glad to do it, for I have now abundance of time and liberty, Mr. Kilby being gone with Lord Loudon to America, to supply the army there (which is to consist of 20,000 men) with provisions. In the mean time he has thought fit to continue me in my post; so that I have, as I said, all things, and abound; that is, all that I want. It is not that I am lifted up above my station as a servant, or abound in worldly goods or wealth, but to let you understand that I am contented in my place; which, if I had lost by his going abroad, a worthy gentleman, in my way of thinking too, would have repaired, by making me the steward of his estate, and then I must have lived wholly in the country. This was agreed to, on condition Mr. Kilby was willing to part with me, concerning which he and that gentleman had a conference. But he not caring to part with me, I remain where I was. I thank you greatly for the offer you make of enriching my small library with some piece that I may count valuable, which when I have well considered, I shall let you know (or Mr. Easton), that you may not conceive that I esteem lightly of your favours, which are offered as a token of your friendship for me, though now and then a letter that I am not forgotten, but remaineth in it, would be a sufficient gratification to me, for my love to my friends is really disinterested; but in cases of want it is good to have them, and I am very desirous of keeping those few I have. I am very glad that nobody has lessened the affection of my friends to me, and hope to preserve such a moral character till I die, or at least to deserve it, that nothing but malice, or ignorance, and orthodoxy, may vainly endeavour to blast it; my letter is so long, that I must desire you to take it as it is, with all its faults, without the polish of a second writing. Let me sometimes hear from my friends in Salisbury, and always be pleased to esteem me their, and Sir, your most obliged and faithful humble servant. I make bold to inform you how my cause has terminated respecting my sentence. Thursday before last I had an order to appear at the Court of King’s Bench, where the first information annexed to the third number of the Free Enquirer was read, and the quotations from that paper, and apart of that which descants upon these words, “Why judge ye not in yourselves that which is.right,” and some blackening of the whole by the King’s Counsel – I was committed to the King’s Bench prison till the last day of the term, when, being brought again, after two Judges had laid their heads together some time, and the subject of the Free Enquirer was highly aggravated by the Attorney General, who gave them to understand that.he had received directions from his M–y to oblige the offender to suffer exemplary punishment, I was sentenced to Newgate for a month, to stand in the pillory, once at the Royal Exchange, and once at Charing Cross; to be committed, after that, to the house of correction for a twelve month, to pay a fine of 6s.8d. and give security for my good behaviour during life. So that I am now among ironed felons in Newgate, hough in what they call theMaster’s Side. I hope GOD and my friends will support me through all. My respects to your brothers and friends. Philip Annett came to Canada as a young man of 19 years, settling first in Southwold Township in Elgin County. In 1832, he married Sarah Vincent. Sarah’s family had lived in the area of Yeovil, England. This was close to Frome, where the Annetts lived. According to the late Ethel Annett, a grand daughter, Sarah’s father was a merchant sailor and had sailed around the Cape Horn three times. Sarah’s mother ran a store in Yeovil. Sarah had a brother, Samuel, who set sail for Newfoundland earlier than the Annetts. When he heard the Annetts were coming to Canada, he sold the store, and put his money in a money belt. He was never heard from again, and the family assumed that perhaps he had been robbed of his money and thrown overboard. Sarah first lived in Elgin County after their marriage, however, she and Philip later moved into the present day Euphemia Township of Lambton County. Philip Annett was a farmer and brick layer. He eventually built a brick home in 1853 to replace his log house. A mill was also a part of his farm and the millstone was on the farm of Edwin Walker as a door step until recent years. As a true pioneer, he and his wife learned the skills of many trades, tanning shoe leather, spinning and weaving cloth and even making straw hats. Philip Annett died in 1866 from Typhoid Fever in Euphemia Township. His grand daughter, Arabella Annett and daughter of James Annett, was sent to live with her grandmother and take care of her for a time. Later Sarah lived with her children and died in 1900 at the home of her son George. Philip and Sarah Annett belonged to the Closed Communion Baptist fellowship. They are buried at Cairo Cemetery in Euphemia Township. I find it unfortunate that the Annett’s failed to inherit the elegant writing style of their ancestors. Call Peter Annett what you will, but as his letters show, he availed himself of a gentleman’s tongue… something that could hardly be said about the crass writings of Kevin and William (Bill) Annett – who truly tips his hand with the stroke of his pen. It just goes to show you that not everything is in the genes…. This is a wonderful genealogy of Kevin’s ancestors. He and his father, William, do their ancestor’s proud. Thank you for posting this. My respect, through association and friendship with Kevin, has just gone up quite a few more notches! It is curious and very strange that you, ‘Heather'(? ), if that is your real name/identity, and your… cohort, Greg Renouf, seem so ‘obsessed’ about Kevin Annett. All these hours and hours of effort creating this and other silly, immature websites and doing such ‘research’ on Kevin Annett for the sheer intent to ‘stop’ him. From literally and figuratively unearthing the very sinister, horrific, and egregiously criminal activities of a dubious monarchical/corporate religious organization, who, through its bogus hierarchical devise since 4th century A.D. and its bogus papal bull of 1302, has the ridiculous gall to presume that all the souls of this world are ‘subject’ to the Pontiff? Your efforts to ‘stop’ Kevin and so many millions of people who seek common law justice to end this century’s old ritualistic barbarism and banish it from this earth! Do you really think you and your ‘religious’ handlers can ‘stop’ a tsunami? Do you even know we have entered the cosmic Age of Aquarius? It is curious and very strange that you, ‘Heather’(? ), if that is your real name/identity, and your… cohort, Greg Renouf, seem so ‘obsessed’ about Kevin Annett. Your efforts to ‘stop’ Kevin and so many millions of people who seek common law justice to end this century’s old ritualistic barbarism and banish it from this earth does not seem very helpful especially to all those millions of children who are tortured, raped, ritualistically and sacrificially murdered! I consider it a ‘last resort’ kind of approach by people who continually ask me if this is my real name. Funnier too when you consider the number of aliases Kevin has duped people with… George D, the guy whose signature and constant Communiques from Brussels are supposed to lend legitimacy to the Common Law Court DOES NOT EXIST. You’ve got a farce.. a fraud…a con of the highest order on your hands and you accuse me of not being me. Ironic. How exactly does Common-Law work when the guy signing your ‘arrest warrants’ and ‘public notices’ is a made up person? Is that legal in your opinion? Whatever, say I’m whoever you say I am, the fact is that you made the effort of posting your comments here not once, but twice and so you validate my existence either way. If the tsunami is coming in this cosmic Age of Aquarius why are you so insecure about little ol me? There is no insecurity regarding your ‘identity’, only your intentions do not seem to be thought through enough, with all due respect. Your entire comment is based upon the presumption that the Vatican/Crown/bankers ARE legitimate. I am not commenting here to ‘attack’ you in any way, but to try to extend understanding to you and your readers to ‘break the programming’. The reason the Vatican/Crown/bankers ARE ABSOLUTELY NOTHING but illegitimate ‘illusionists’ complete with costumes, pageantry, cathedrals, heraldry, paid mercenaries/security guards and a world wide state of the art system with complex surveillance all created to control the minds of the people to maintain their LIE b/c the ‘unalienable, unlimited, powers/Rights, being Divine in nature, have ALWAYS been first and foremost ‘vested’ in the people/Man, from our soul’s conception and contemplation by our Universal Creator. Ultimately, it is the people’s solemn responsibility to organize common law Grand Juries for the highest possible chance of justice based upon evidence gathered by uninterested third parties to the injured party/accused, testimony given in Affidavit form under penalties of perjury by the injured/traumatized individual people for a true bill of indictment or perhaps the jury finds there is not enough evidence to indict for trial. When ‘public’ trustees like Popes, Queens/Kings, egregiously violate their ‘royal subjects’, in the case of’ Monarchs; in other cases like the United States of America, it is the limited powers extended for the ‘public trust/trustees’ and if the People’s Rights are consistently violated, the Office is considered ‘abandoned’ and the powers of the public trust are escheated back to the people from whence they originate. This is NOT an easy endeavor by any stretch, b/c the people are NOT used to taking full responsibility for their thoughts, words and deeds. Anonymous on THE CON IS OVER!!! Truth Seeker on THE CON IS OVER!!! Heather on THE CON IS OVER!!! ROLAND MITCHELL on THE CON IS OVER!! !